San Diego is a golfers paradise! Some of the most beautiful public and private courses in America can be found in San Diego County. With over 80 courses in the region, there is something for everyone. Many of the best courses are just minutes from the SAA Conference Hotel, and can be easily reached by taxi or bus. Getting a Tee Time at some courses can be challenging, so the best advice would be to plan ahead and know when and how to schedule a round at the course you want to dominate. A quick Google search of “San Diego Golf” will bring you to some websites which will help you book Tee Times, but they do charge a fee. To save money, call a course far enough ahead of time and they can walk you through the booking process. Read on to find out about some of the courses which are the local favorites. Quite possibly one of the most beautiful courses in the world, Torrey Pines is about a 25-minute drive north of the Conference Hotel (~16 miles). 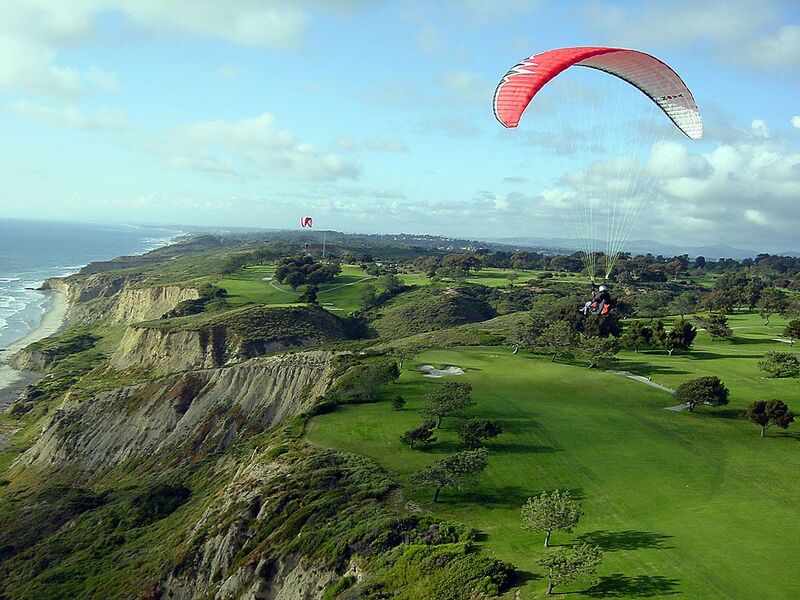 The sight of the 2008 US Open, Torrey Pines is situated on the Pacific Ocean in La Jolla and can be quite challenging. However, the incredible views will make that triple bogey that much easier to take. Another scenic course on the water is located just across the bay from our Conference Hotel. The Coronado Golf Course is a moderately challenging 18 hole course which provides excellent views of San Diego and Coronado Island. After you set the course record, you can walk to the Hotel Del Coronado to celebrate! The closest golf course to the Conference Hotel would be the Balboa Park Golf Course. This public gem boasts both 9 and 18 hole options, in addition to a driving range. While playing Balboa, you will enjoy views of downtown San Diego and Point Loma in the distance. Nearby is the Morley Field Disc Golf Course where you can rent specialized Frisbees and toss them through 19 holes of obstacles. If you have never tried disc golf, it can be a fun, relaxing experience. There are many other exciting courses close to our Conference Hotel, including Riverwalk, Sailho and the 9 hole Mission Bay Golf Course, which is lighted and is open for late night play. Whichever course you choose, good luck, and remember it is only a game! This entry was posted in Attractions and tagged balboa park, Coronado, exercise, golf. Bookmark the permalink.